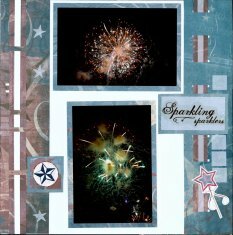 The July Challenge Book of Me Scrapbook Layouts will focus on the Reflections of Life. Life is full of ups and downs. Challenges. Choices. Disappointments. Recovery. So many times we document the good times in our scrapbooks, though we know there were some difficulties that we went through as well. 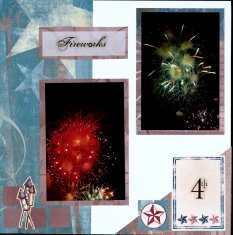 As our Book of Me Scrapbook Ideas have shown many of the joys we have experienced, we need to let our readers know that there were some hard times as well. Our lives weren't always "beds of roses," and they need to see that reality to know the true person behind the pages of the book. Take your time to reflect on the topics, jot down your thoughts, and create pages that show, if only in a glimpse, the events that helped to make you the stronger and better person you are today. I was surprised at how this challenge actually helped me to look at some difficult times in a different light. Option #1 - CHOICES I HAVE MADE - We make choices every day--big and small. From what to make for dinner, to what kind of car to buy, to what school I (or my child) should attend; each one affects us in some way. Look back to a choice you made that, for better or worse, changed your life. Was it the right one? Would you make the same one today--if not, what would you have changed? How would your life be different if you had chosen a different path? 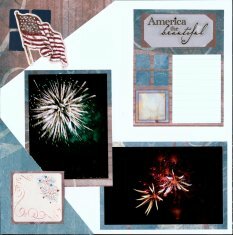 Better yet, let this Book of Me Scrapbook Layout turn the decision into the right one with serious thoughts of all you have to be grateful for. Option #2 - REFLECTIVE WORDS - Words can have great meaning. Whether they come from literature, song lyrics, scripture, or the mouth of a famous (or not so famous) person. There are some that cause us to see our lives, and often our world, differently. We often have a line or passage that puts us in a reflective mood, reminding us of past events or feelings. In this layout, include some meaningful words and scrapbook journal about what they mean to you, and how you feel when you think about them. Option #3 - DIFFICULTIES I HAVE FACED - Has there been an event which considerably impacted your life? Perhaps it was an accident or illness, the death of a loved one, a divorce. How did that event change you, your faith, your outlook on life? How did you cope then, and how do you see that event today? Use this opportunity to look at the good things that have resulted even if it's only that fact that you made it through! Use the layout in the future to remind yourself of how strong you are. If you truly can't think of such an event, create a layout about how you think you would deal with a difficulty such as these. Option #4 - CELEBRATE INDEPENDENCE DAY A Special Addition for the Book of Me. What are your favorite things to do on July 4th. Do you have special childhood memory surrounding the Forth? Of course, there are always the Fireworks, perhaps a special trip to visit family, great local sporting events, fishing trips, cooking out, parties. Do you have any photos from these events as a child. Taking Fireworks Photos to get the best photos for your Fireworks event. And for your Beach Trips, check out this link for Beach Photography Tips. - August Challenge - Me, Right Now! 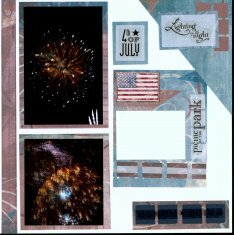 Miss the Book of Me Scrapbook Layouts - June Challenge?